This purse makes for a great mini cross body bag or a fancy wristlet. 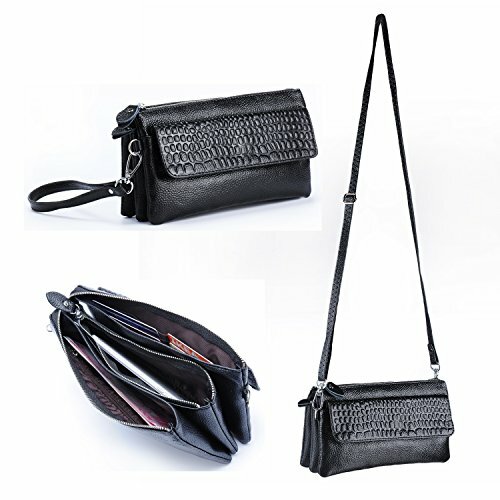 The clutched style design is good for those who just want to carry under arm or on the wrist strap. There's another long strap for wearing over the shoulder or cross way for security and to keep your hands free. It's long enough for even a bigger girl! This purse can hold much more than meets the eye without being bulky. The outside flap pocket is large enough for an iPhone 7+ with a lifeproof case on it. The flap is magnetic so when your phone rings you can grab it conveniently. The inner pocket is zipped and for extra protection also the whole wallet zips to cover all the inside pockets so you don't have to worry about losing anything. It's perfect for those quick trips or walks to the store. You don't have to lug a heavy purse and leave hands free to carry other shopping bags! Best about this bag is it's large enough to fit all the essentials and small enough to fit comfortably into a big purse. The strap hooks on opposite ends so the purse doesn't lean forward and keeps it close to your side and easy to use. Be sure to compare the wallet with any bag you have in case the size doesn't meet your expectation. Material: Synthetic leather, premium hardware. Structure: 1 outside magnetic pocket; 3 large compartments including 1 inner zipper pocket and 6 card slots. Zipper closure. It comes with a long strap to carry like a purse and with a short strap to make it a wristlet. Approximate dimensions: 7.9 (L) x 2 (W) x 4.1 (H) inch. Maximum shoulder strap drop: 52". Package includes 1 extra synthetic leather card holder with 12 card slots. If you have any questions about this product by Gottowin, contact us by completing and submitting the form below. If you are looking for a specif part number, please include it with your message.